At its premiere in 1791, Mozart’s La Clemenza di Tito was already something of an anachronism: an opera seria at a time when opera seria was in sharp decline, and a tribute to a monarch at a time when Europe’s monarchs were being guillotined left, right and center. Yet, at the Metropolitan Opera on Saturday night, Mozart’s opera never sounded fresher, a superstar cast shining new light on one of the composer’s all-too-seldom-performed scores. 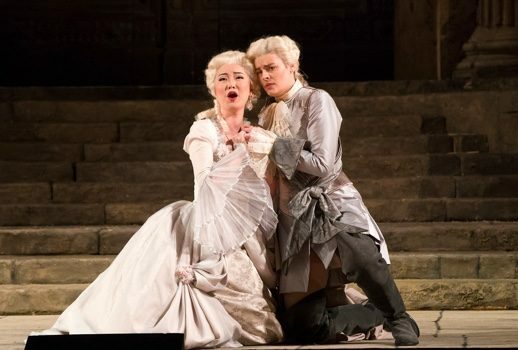 This was largely owing to Elza van den Heever’s breathtaking performance as Vitellia, which, despite a lack of power in the low register, was a tour de force of vocal flamboyance. Van den Heever sang with a rare mix of Mozartian beauty and raw passion, her tone at once luscious and bright, and although her chest voice was, for the most part, inaudible, she made up for it with a consistently dazzling coloratura and a formidable stage presence to boot. Her “Non più di fiori” was one of the musical highlights of the evening, Van den Heever’s perfectly-executed lyricism and Inn-Hyuck Cho’s dulcet basset horn proving a radiant combination. Van den Heever’s turn as the vengeful noblewoman was like something out of Mommie Dearest: she played Vitellia as a campy diva—sassy, playful, venomous, and ultimately seductive. 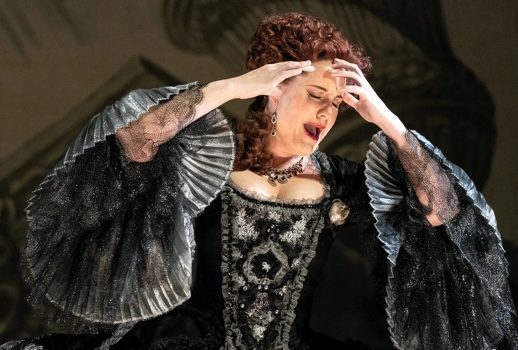 Her larger-than-life performance reached its apex in the first act when she executed one of the lowest curtsies I have ever seen, in one of the widest pannier skirts I have ever seen, all while spitting venomous recitative. Joyce DiDonato showcased her staggering vocal versatility as Sesto, moving with ease between graceful messa di voce, rich chest voice, sprightly coloratura, and delicate pianissimo. Her act-one “Parto, parto, ma tu, ben mio” was a masterclass in musical characterization, DiDonato finding dramatic potential in some of Mozart’s most outlandish vocal acrobatics. Her act-two “Deh, per questo istante solo,” although emotionally charged, lacked the consistency and clarity required for such an intimate dramatic moment; however, this was a minor lapse in an otherwise electrifying performance. DiDonato brought a hotblooded energy and a clumsy butchness to Sesto. Her Sesto was more bumbling and impressionable than morally conflicted, which only made the botched murder plot feel all the more real and her character all the more lovable. Between the spell-binding singing and somewhat goofy acting, one would have to have been a monster not to have granted DiDonato’s Sesto clemency. Emily D’Angelo sang Annio with a delightful warmth, maintaining a lightness of tone even when imploring Tito to spare Sesto’s life. She was the perfect counterpart to Ying Fang as Servilia, who exuded effortless charm in their breezy act-one duet. The cool-headed tenderness they bought to the young lovers was the ideal ploy to the combustible chemistry of DiDonato’s Sesto and van den Heever’s Vitellia. His Tito often seemed more gawkily patronizing than benevolent, his acting paling in comparison to the high-powered prima donnas he shared the stage with. Under the baton of Lothar Koenigs, the Met Orchestra bounced through Mozart’s score with vigor and buoyancy, reminding us that La Clemenza di Tito, for all its high-flown classicism and convoluted politicking, is a joyous, celebratory work. If the orchestral balance was often rather bass-heavy, this only lent punch to Mozart’s boisterous marches. The orchestra was at its best in the accompagnato recitatives, matching the cast’s impassioned singing with terse, peppy interjections. Jean-Pierre Ponelle’st 35-year-old physical production, with its postmodern mash-up of Roman ruins and powdered wigs, seemed a little tired. For all that the faux marble appeared more faux than marble, and the finely-painted backdrops were a tad faded, the overall austerity of the staging left the singers relatively unencumbered, allowing space for them to interpret and inhabit the score.